Premium provider of online casino solutions Play’n GO is going back in time with its Game of Thrones-inspired slot game called Dragon Maiden which features expanding wilds, free spins and golden free spins to present you with a chance to win up to 5,000x line bet on a single spin. Dragon Maiden is a 5 reel slot game with initial 243 ways to win. The game’s dynamic mechanic will push the win ways to whopping 7,776 during the bonus feature where both excitement and winning potential will of the game will keep you on the edge of your chair. This particular Play’n GO title is a high-volatility game which has a great potential to be one of the trending slot games. It houses an RTP of 96.49% and offers a wide range of available bets. With spins costing from €0.20 to €100 as the maximum wager, there will be a wide audience looking to have a pop at this history adventure game. HOW TO PLAY Dragon Maiden? With dragon scale used as a reel backdrop and glowing landscape complementing the visuals in the background, Dragon Maiden truly is a game rich in detail. Play’n GO have played it safe by adopting a wildly popular theme – a shout to all Khaleese fans out there – in combining dragons and powerful women but the developer made sure to tie in an equally powerful gameplay into this slot. When it comes to the actual gameplay, Dragon Maiden requires you to line up at least three or more matching symbol on subsequent reels from left to right. Knowing it’s a 243 winning ways slot, you don’t have to keep track of the paylines – as it will become extremely hard once the game expands into a 7,776 winnings ways playing set. Play’n GO have once again made it ever so easy to choose your desired spin cost by laying all available options – going from €0.20 to €100 – right in front of you. The spin button – coloured in green – is prominently visible on your right-hand side of the screen, whereas you also have other options to choose from, such as the Auto Play button and the paytable shortcut. To lay it all bare in front of you, symbols you’ll play with are clearly associated with the theme. There is a nicely designed playing card suit set as low denominations, while you’ll also find dragon coins, daggers, rings, gems and the Maiden herself topping the chart in value. She can transform into a Wild symbol, while the list is completed by the Dragon Scatter. Dragon Maiden truly is a remarkably engaging game. Don’t be fooled by its relatively unimaginative theme because, by playing it safe to appeal to a wide audience, Play’n GO made sure to spread the word on this feature-packed slot like a dragon fire. Dragon Maiden Wild – While she will reward you with 1,250 coins for five on the reel set, the Dragon Maiden symbol will also substitute all other symbols except for the Scatter. Not only that, though, Dragon Maiden has the ability to turn Wild – which she’ll do randomly – when it can also expand to become 2 or 3 symbols high (a full reel). Dragon Scatters – Not only will this symbol trigger the Free Spins bonus we’ll discuss further below, Dragon Scatters will also initiate the Re-Spin feature which is a nice complement to the overall action-packed gameplay. Once you land two of these, a Re-Spin feature will be activated with Dragon Scatters held in place to boost your winning chances. The Re-Spins will continue until there are no more Dragons appearing on actual re-spins. Free Spins – Now let’s just imagine you went straight to at least three Dragon Scatters on the grid during a single base game spin. What happens then? Free Spins, you know it. Three Dragons equal 8 Free Spins, 4 will give you 10 complimentary spins and a full set of 5 Scatters will top it up by 12 free rides. Do note that Dragon Scatters will gain extra power during this feature to push the reel grid one symbol up – to a maximum of 6 symbols high. This is when game’s winning ways rise up from 243 to 7,776. What’s more, once you reach the maximum highs on a reel, the game will reward you with a Golden Free Spin feature. Golden Free Spins – remember, this feature will be played once all of your regular Free Spins are rolled out. It is played on the maximum-sized grid (5×6) where additional five spins will give you a chance to pocket even more coins and reach the full potential of this greatly engaging game. 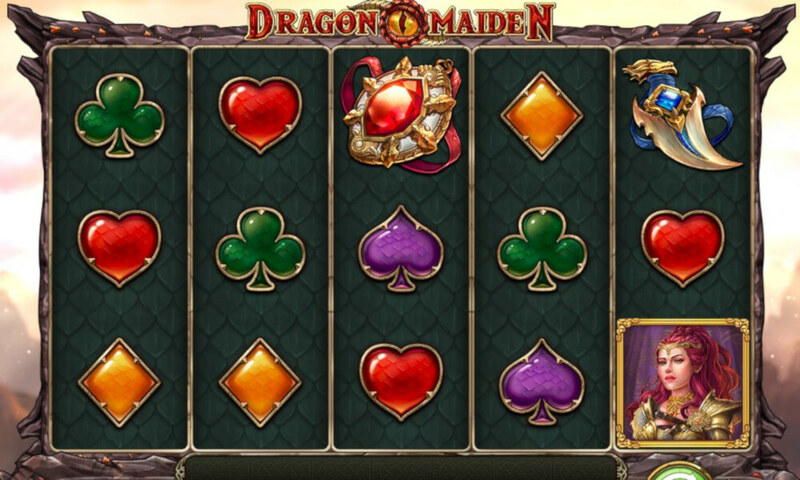 While other developers are slowly shifting their focus to a more gamified slot concept where slots become similar to video games you play on computers and gaming consoles, Play’n GO opted to go old school with one of their latest products – Dragon Maiden. Not only is this slot revisiting a familiar theme which is not as innovative and creative as one would expect, but Dragon Maiden is crushing the stereotypes by introducing a simple, yet incredibly engaging gameplay. Expanding reels, symbols turning into wilds and two types of free spins are more than enough for a highly positive final verdict. Dragon Maiden is a highly volatile video slot which will keep you excited and handsomely rewarded. Players, we need your help with how we should to rank and rate these reviewed casino games. You can help us by rating this game, and if you really enjoyed playing Dragon Maiden. You can also share it with your friends on Facebook, Twitter and via email. For all freeplay games, if your free credits run out, simply just refresh the page and your balance will be restored.